Strygwyr, the Bloodseeker, is a melee agility hero imbued with dreadful powers to fuel violence and rip enemies apart in the heat of close combat. He can drive targets into a maddened Bloodrage, increasing the damage of their attacks, and allowing them to heal their wounds by killing their enemies. He can also cast Bloodrage on himself turning him into a nuker. His speed is unmatched when he senses the blood of the dying, and from this perception none can escape his Thirst. By using Blood Rite, he can create a ritual field where his foes will be silenced and damaged in the process. His trademark ultimate, Rupture, sunders the skin of his victims, causing them to trail their life force behind if they dare to flee. The ability is so persistent just like Bloodseeker himself, totally ignores magic resistance and immunes to any kind of Dispel. Almost nothing can save the victim from the wicked wound and the wicked hunter coming for them, except the death itself. Play "You should be honored to bleed so that the Flayed Ones may live." Cannot be cast on enemies. Can be cast on allies. Bloodrage: Dispellable with any dispel. Bloodrage amplifies all three damage types the bloodraged unit deals and takes, including self-inflicted damage and damage dealt by allies. Does not amplify outgoing damage when it has the no-reflection flag. The heal is based on the dying unit's maximum health, and not on the health of the unit that gets healed. Bloodrage does not heal upon killing illusions, Tempest Doubles, Roshan, wards, or buildings. Denying allies while bloodraged, or denying bloodraged allies heals the killing unit. Suiciding heroes still heal buffed allied units when within the radius, but for halved values. When a bloodraged unit attacks another bloodraged unit, the damage is overall amplified by 21%/32.25%/44%/56.25%. Does not amplify damage dealt by abilities that use an independent source of damage (e.g. Proximity Mines, Death Ward). Successive casts with different levels on a same target only refresh the duration, but do not update the damage amplification and heal percentage. The disable help function prevents an allied Bloodseeker from casting this ability on you. Bloodseeker baptizes an area in sacred blood. After 2.9 seconds the ritual completes, causing any enemies caught in the area to take damage and become silenced. The affected area is visible to enemies. Applies a silence within the targeted area after the 2.6-second delay. Bloodrite first applies the damage, then the debuff. With max level Bloodrage on Bloodseeker, Blood Rite deals 156.25/218.75/281.25/343.75 ( 250/312.5/375/437.5) damage (before reductions). With max level Bloodrage applied on both Bloodseeker and the enemy unit, it deals 195.3125/273.4375/351.5625/429.6875 ( 312.5/390.625/468.75/546.875) damage (before reductions). Choosing the damage upgrading talent immediately upgrades all of Bloodseeker's currently active Blood Rite casts when chosen during the delay. Grants 600 radius ground vision at the center of the affected area for 6 seconds after cast. Completely ignores spell immune enemies. Disables all aspects of the ability, the detection, speed bonus and the speed limit removal. Learning Thirst removes the 550 movement speed cap for Bloodseeker. The first stack is applied when an enemy hero is below 75% health and the last when below 26%. Grants 0.6/0.9/1.2/1.5 attack speed and 0.24%/0.48%/0.72%/0.96% ( 0.6%/0.84%/1.08%/1.32%) movement speed for each percent of missing health between 75% and 25%. However, since the HUD does not show decimals, attack speed increases by 1 for every missing 1.67%/1.11%/0.83%/0.67% health, and movement speed by 1% for every missing 4.17%/2.08%/1.39%/1.04% ( 1.67%/1.19%/0.93%/0.76%) health. When an enemy hero drops below 25% health, Thirst applies True Sight and makes them visible through the Fog of War. When enemies are revealed by Thirst, a debuff and particle effects are placed on them, which is visible to everyone. Bloodseeker himself also gets a status buff and particle effects and speaks certain lines, making it clear that an enemy is currently being revealed by Thirst. Thirst is not triggered by enemy illusions, but is triggered by hero clones. Is not triggered by hidden enemy heroes, but does react on invulnerable ones. The bonuses linger for 4 seconds if the enemy dies. However, it does not linger, and disappears immediately if the enemy has Aegis of the Immortal or Reincarnation. The bonuses are always the maximum values, despite the health percentage the enemy had right before the killing blow. Causes an enemy unit's skin to rupture. If the unit moves, it takes a percentage of current health as damage per 100 units moved. The damage is dealt through spell immunity. Grants charges to Rupture with a seconds replenish time. Checks the distance the affected unit moved every 0.25 seconds, starting immediately upon cast, resulting in 33/41/49 checks. If the unit's position changed between checks, it takes damage based on the distance. There is no minimum distance required to take damage. Even a fraction of a distance results in damage. If the unit is invulnerable as a check occurs, the value is set nil, so that it does not take damage on the next check, regardless of distance. Rupture's damage is not lethal, and can never kill a unit. Multiple casts on the same target do not stack, but refresh the duration instead. Despite the sounds, affected units take no damage when moving upwards (with e.g. Torrent or Impale). Can be cast on, but cannot damage couriers. Stout Shield provides early protection from harassment and reduces the damage taken from creeps. Quelling Blade gives more damage when hitting creeps, and is amplified by Bloodrage. Healing Salve allows Bloodseeker to heal up in situations where his health is so low that trying to heal with Bloodrage becomes too dangerous. Boots of Speed gives a higher base move speed, increasing the effectiveness of Thirst, and the item can be upgraded for very gold-efficient damage or stats. Wind Lace and Orb of Venom are cheap options for filling inventory slots, maximizing Bloodseeker's ability to chase down and stay close to enemies. Magic Wand provides some attributes and a way to restore Bloodseeker's health and mana on demand. Power Treads provide more attack speed and agility for increased damage output; Bloodseeker can switch to strength for survivability, or intelligence for mana when using abilities. 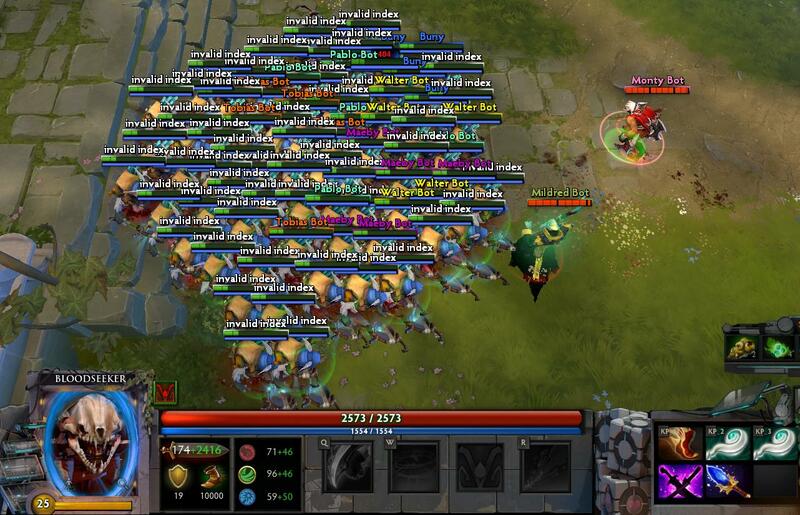 Radiance's area damage allows Bloodseeker to quickly farm large numbers of creeps at once, making it a valuable item when Bloodseeker is taking a carry role. The area damage is amplified by Bloodrage, and allows him to both gain Thirst bonus from all nearby enemies. Sange and Yasha gives Bloodseeker many bonuses including attributes and movement speed. Black King Bar makes Bloodseeker immune to most disables and nukes, allowing him to safely enter teamfights. Silver Edge can be extremely helpful in ganking due to Bloodseeker's naturally high speed, and able to break enemy passives. Abyssal Blade gives Bloodseeker a powerful stun and a modest measure of durability. Butterfly provides much needed agility and attack speed as well as evasion. Nullifier mutes items of the enemies to add on top of Blood Rite's silence; it can also cancel Town Portal Scroll. Blade Mail prevents enemies from targeting Bloodseeker during teamfights. Echo Sabre is sometimes used as an early game source of extra damage and mana, and works well with chance-based attack modifiers such as Skull Basher. Hand of Midas is sometimes bought if Bloodseeker has a good early game, or needs to match harder carries in the late game. Mjollnir is another option in games where Bloodseeker desires a form of AoE damage. Monkey King Bar adds to Bloodseeker's attack damage, and counters evasion from the enemies with its magical damage Pierce procs that guarantee to land. Aghanim's Scepter allows Bloodseeker to cast Rupture twice, and also gives him some nice attributes and stats. Eul's Scepter of Divinity gives you movement speed and mana regeneration which Bloodseeker needs as well as a way to stop enemies from teleporting away. Dagon is sometimes picked up to deal high initial damage during ganks, thereby trigger Thirst's damage and speed bonuses to instantly give Bloodseeker the upper hand and finish off the target. Its damage is amplified with Bloodrage. Ethereal Blade gives decent attributes, and can deal huge damage when combined with Dagon and the damage amplification from Bloodrage. The Flayed Twins' obscene demand for blood could only be met through constant carnage, a task for which Strygwyr was more than suited. Driven by insatiable Thirst, the Bloodseeker senses injured foes from leagues away, and chases them down with eager speed. Through sacred markings on his gear, the blood of the freshly sacrificed flows directly to the Flayed Ones, leaving just enough to mend his wounds and fuel his Bloodrage. Strygwyr paints the land with a crimson ring, silencing foes caught in this Blood Rite. Those who run only hasten their own demise. The Bloodseeker Ruptures every artery, causing his victim to hemorrhage with each step. By blood loss or by Strygwyr's tribal blades, death is but a foregone conclusion. With Thirst, Bloodseeker is the only hero which can reach the game's absolute movement speed limit of 10,000 movement speed. However, this is not achievable in a normal match. This part of Blood Rite's Play sound effect makes use of Play this Bloodseeker voice response. Despite the character having an Aztec or Incan motif, Strygwyr likely a Welsh-influenced rendering of the Romanian word 'strigoi', meaning poltergeist, often used in folklore in reference to vampires. Bloodseeker's Thirst trigger response Play "Blood is in the air." is most likely a reference to the song "Love is in the air". Bloodseeker's respawning response Play "Don't be negative… be positive!" is a reference to the blood types B-Positive and B-Negative. Bloodseeker's Rupture kill response Play "Lie down… have a cookie." is a reference to blood donation procedures where patients lie down and are given sweet treats to compensate for the sugar loss. Bloodseeker's battle begin response Play "I love the smell of serum in the morning." is a reference to a quote of the movie Apocalypse Now where Lieutenant Colonel Bill Kilgore says "I love the smell of napalm in the Morning." Bloodseeker's death response Play "Sangre…sagrada." is spanish for "Sacred/Holy blood". ↑ Bloodseeker reaching the movement speed of the game. This page was last edited on 16 March 2019, at 05:55.